October Burger of the Month – Jalaween! At Teddy’s Bigger Burgers we don’t only dress up on Halloween! Remember our Double Trouble with double stack burgers & cheese or the Spud with a hash brown patty, bacon and cheese? Our burgers get the chance to be dressed up every month! It’s something we love to do! This month, in honor of Halloween we are going for HOT & SPICY with our Jalaween Burger! Muy cliente jalapenos, onion rings and pepperjack cheese! Your mouth will be watering…hopefully not from the heat. We can just hear it now: “Trick or Treat” – piquant style! Top off your Jalaween Burger with our delicious pumpkin shake. Pumpkin spice makes everything nice! 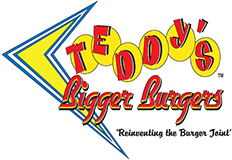 Get your fix of hot and spicy at Teddy’s Bigger Burgers! It’s our trick and your treat! Happy Halloween from all of us here at Teddy’s Bigger Burgers!